1. Children should be able to identify Adam and Eve by name. 2. Children should be able to tell the story of the Fall. 3. Children should identify Satan, the snake. 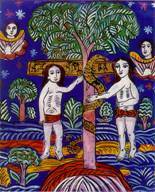 Tell the story of Adam and Eve from the Children’s Bible Reader, pp.21-22. Adam and Eve ate the forbidden fruit. Adam and Eve always obeyed God. God created Eve from Adam’s rib. An elephant told Eve to eat the fruit. Satan as a snake told Eve to eat the fruit. God let Adam & Eve stay in Eden. Ask the children: Why did God create people? How can people help God? Discuss disobedience: Do we ever disobey our parents? God? Why is it so easy to disobey when we know better? Why do we choose to disobey? What happens when we disobey? Make a Rigatoni Snake: Make colorful rigatoni with magic markers or food coloring. Tie 18-inch piece of yarn around one noodle; decorate this piece with eyes to be the head. String rest of yarn with rigatoni, tying a ½-inch jingle bell on the end as a tail.